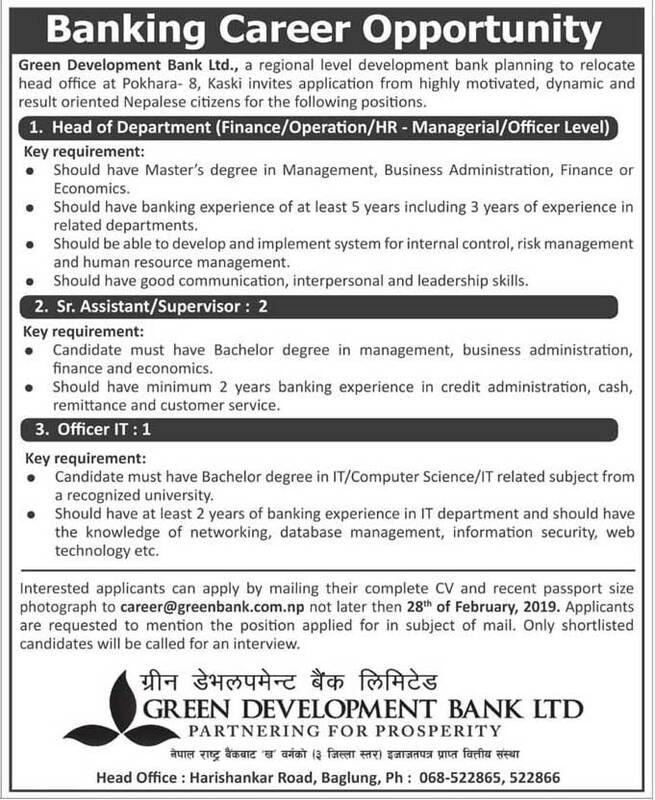 Green Development Bank Ltd., a regional level development bank planning to relocate head office at Pokhara -8, Kaski invites application from highly motivated, dynamic and result oriented Nepalese citizens for the following positions. > Should Have Master’s degree in Management, Business Administration, Finance or Economics. > Should have banking experience at least 5 years including 3 years of experience in related departments. > Should be able to development and implement system for internal control, risk management and human resource management. > Should have good communication, interpersonal and leadership skills. > Candidate must have Bachelor degree in management, business administration, finance and economics. > Should have minimum 2 years banking experience in credit administration, cash remittance and customer service. > Candidate must have Bachelor degree in IT/Computer Science/ IT related Subject from a recognized university. > Should have at least 2 years of banking experience in IT department and should have the knowledge of networking. Database management, information security, web technology etc. Interested applicants can apply by mailing their complete CV and recent passport size photograph to career@greenbank.com.np not letter then 28th of February, 2019. Applicants are requested to mention the position applied for in subject of mail. Only shortlisted candidates will be called for a interview.